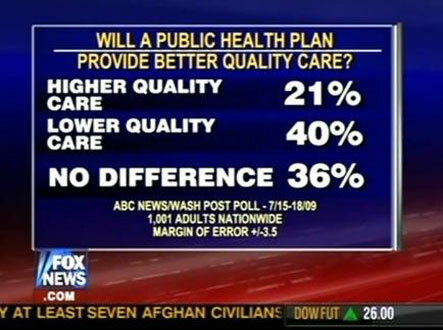 Vice President of news at Fox News Channel, Bill Sammon references a poll (see below), which Fox News attributes to ABC News, as showing that more people do not want a public option included in the health care reform package. SAMMON: Well, that’s true. And, you know, you have to — you have to figure that President Obama is feeling whipsawed, because on the one hand, people are saying they don’t want the public option, as that poll demonstrates. Republicans are showing up at these town hall meetings and objecting. On the other hand, you’ve got liberal Democrats saying, look, you better put that public option back in there. The poll figures, as seen above, are from an Ipsos/McClatchy poll from early July, 2009. Click on the image below to view the actual poll questions and results. You’ll notice that the first question shows that the majority feel that it’s necessary to have a public option.